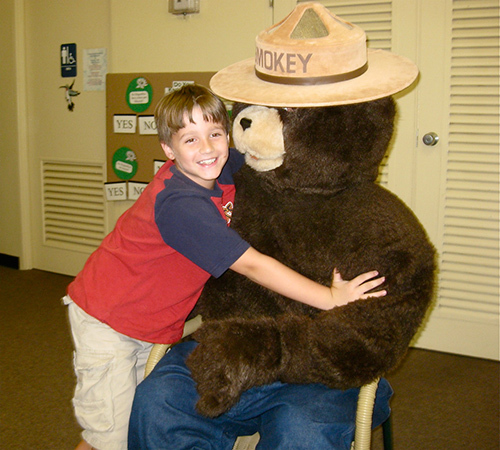 Smokey Bear turned 70 years old this past Saturday, August 9, 2014. I feel a special kinship with the old bruin and forest-fire-prevention representative for two reasons: 1) he has a unique tie to my home state of Wisconsin, and 2) as an avid fan of forests, I have often pondered his singular message and found I have conflicting opinions on it: over the years, has it “saved” millions of acres of forest from the flames, or did Smokey do his job a little too well? In the spring of 1942, off the coast of southern California in the midst of World War II, a Japanese submarine fired on an oil field near Santa Barbara, close to the Los Padres National Forest. The fear that an enemy could set off raging forest fires grew. How to protect the country’s lumber supply with most of the former firefighters and able-bodied men now away in the armed forces became a matter of national importance. With the help of the Wartime Advertising Council, the U.S. Forest Service organized the Cooperative Forest Fire Prevention Campaign. When Walt Disney released the cartoon motion picture Bambi in 1944, his studio loaned its lead character to the general education effort for one year. For its long-term “spokes-animal” and the country’s number one firefighter, the forest service chose a black bear. “Smokey Bear” made his first appearance on August 9, 1944, in a poster by Albert Staehle. The Ad Council introduced Smokey’s well-known slogan, “Only You Can Prevent Forest Fires,” in 1947. A few years later, an unfortunate event really brought Smokey Bear “to life.” On a spring day in 1950, a 17,000-acre wildfire engulfed a section of the Lincoln National Forest in the Capitan Mountains in New Mexico. Forest rangers, civilian volunteers and army personnel who were working to contain the blaze reported seeing a black bear cub wandering near the fire line. Thinking his mother might come for him, they left the little bear alone. The conflagration turned into a firestorm, and several soldiers just barely escaped by laying face down on a rockslide for over an hour until the fire burned past them. The bear cub fled to a tree, but he badly burned his paws and hind legs. The soldiers carried the bear out of the fire zone and gave him to a local rancher. 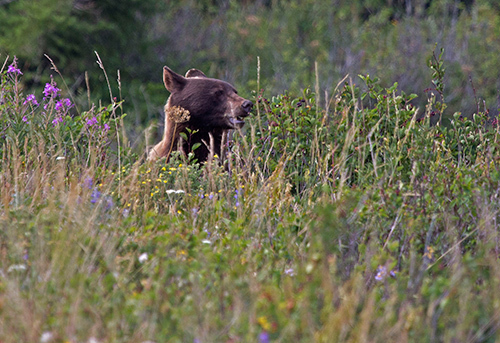 A New Mexico Department of Game and Fish ranger heard about the cub and drove to the rancher’s home to pick up the bear. The cub was flown to Santa Fe, where a veterinarian treated the burns. The press picked up the story, and the public fell in love with the little survivor. The New Mexico state game warden presented the cub to the U.S. Forest Service chief with the understanding that the bear would be dedicated to spreading a conservation and fire prevention message. Little “Smokey Bear” was relocated to the National Zoo in Washington, D.C. In 1950, it was three Wisconsinites—Neal Long, Frank Brunner and Ada Hart—who constructed the first Smokey Bear suit that a person could wear. According to the Ad Council, Smokey has become the star of the longest-running public service announcement campaign in American history, and 96 percent of Americans recognize his illustration and one-sentence message. But Smokey may have done his job a little too well. The awareness he brought to the public about the dangers of forest fires undoubtedly saved many lives and thousands of acres of forest. But without natural fires, a forest cannot live and grow. After a forest fire, immediate, phenomenal growth takes place. Fire rapidly breaks down organic matter and releases nutrients, such as phosphorus, potassium, calcium and magnesium, which are ordinarily locked up in the living trees and plants or in the decomposing matter on the forest floor. These nutrients enrich the soil, giving plants a burst of energy. Fires can, then, accelerate the work of years of bacterial decomposition. And partial or complete clearing of the forest canopy by fire permits intense photosynthesis on the floor, causing sun-loving plants to push up and through. Not all the trees in the forest are damaged by a natural fire. Some have evolved to survive blazes. Mature red and white pines have thick bark that protects their cambium from the fire’s heat. With their foliage at the top of their tall trunks, they are immune to anything but crown fires. And even if a particular stand of pines is burned, there is almost always a small number of survivors whose seeds, falling to a floor now burned clear of the thick, inhibiting needle litter, can germinate to begin the building of a new pine forest. Some plant species, such as jack pine, need fire to release their seeds, which are sealed in pitch. Without fire, seeds of other various plants may lie dormant in the soil for years. One of those accidental, manmade fires occurred last year in Yosemite. 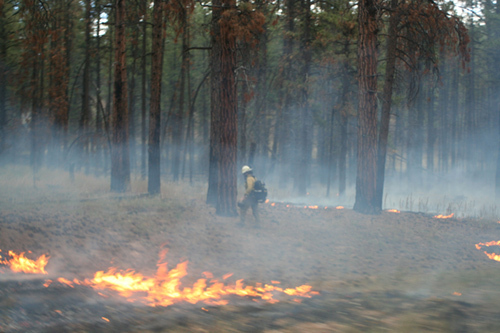 The Rim Fire burned 398 square miles, becoming the largest wildfire in Sierra Nevada history. Last week, a bow hunter was charged with starting the blaze. The man was on a solo hunting trip in the Stanislaus National Forest on August 17, 2013. Despite a ban on campfires due to the parched conditions, he lit one to heat soup. The wind carried embers uphill into bone-dry brush that subsequently ignited. Do you think Smokey did his job a little too well, making the public think that all forest fires are bad? Or given current climate change and its resultant drier conditions, is his message more relevant than ever? I was up in Flagstaff a few weeks back hiking to the top of Humphreys Peak and was surprised to see at least four controlled burns taking place to clear the under brush around Grand Canyon National Park. Fires can be rejuvenating to the environment as well. What was once a burned out hillside of Ponderosa Pine is coming back with new growth Ash trees. I think people tend to overreact to anything that they hear or see. 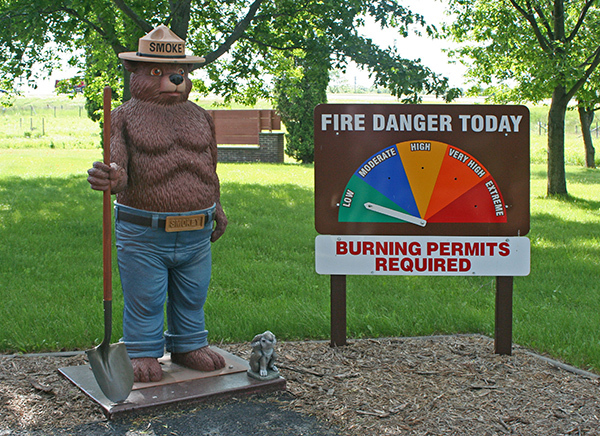 Smokey was mainly used to educate people on preventing forest fires by careless actions by humans, not natural forest fires caused by lightning strikes. The Yellowstone Fire of 1988 was a clear example of a forest fire that did cause extension damage that can still be seen today and has perpetuated the movement for all forest fires to be quickly taken care of/or avoided at all cost. Because those forest habitats haven’t grown fast and you can still see evidence of that forest fire that occurred almost 30 years ago, people say that allowing natural caused forest fires are a bad thing. is passed from Adults to children and Children to Adults !! He serves as a good example for all ages !! That’s cool! I had no idea about the Bambi tie-in.